State Sen. Kevin Eltife, R-Tyler, is engaged in a long-term campaign to convince his fellow legislators that the state's bond debt is an urgent problem and that tax increases are part of a conservative solution. The panel’s moderator warned Eltife that Tea Party activists would not like what he was proposing. Eltife waved him off. “You know, it is what it is," he said. "I was fine before I had this job. If they kick me out of office, I’ll be fine." Cheers filled the ballroom while Eltife stifled a smile. His remarks were reported around the state. The East Texas lawmaker has never been shy about discussing his preference for raising taxes over increasing public bond debt. 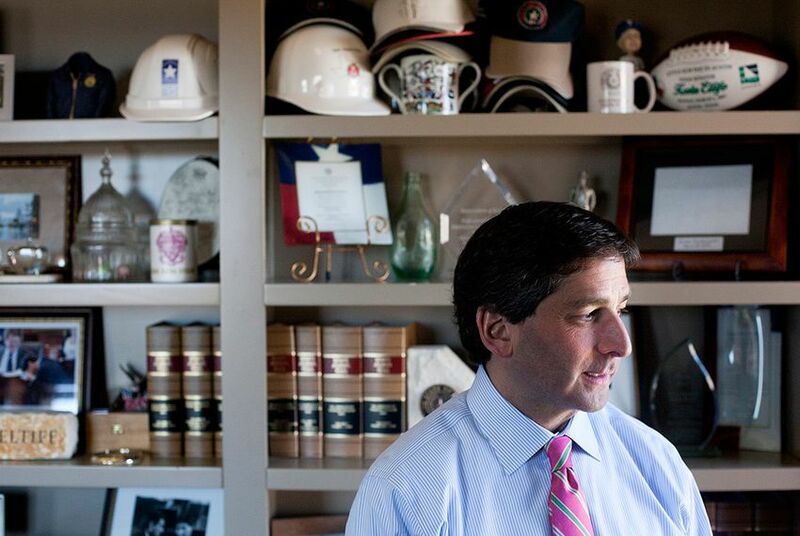 Last week, he filed a measure to raise the state sales tax temporarily to pay off the Texas Department of Transportation’s debt, calling it the conservative way to “deal with our debt problem.” While pushing harder than ever to draw colleagues to his way of thinking, Eltife is challenging not only the ways his party manages the state’s finances but the very notion of what it means to be a conservative in Texas. Eltife, 54, joined the Senate in 2004 after serving six years as mayor of Tyler. In the nine years since, the state’s outstanding debt has more than doubled, to $41.3 billion from $19.5 billion, according to a comptroller’s office report. That debt per Texan has grown to $1,584 from $865. Though the state maintains a strong credit rating, the Legislature’s reliance on debt has frustrated Eltife. As mayor, his signature achievement was a voter-approved tax-reform package that cut property taxes but raised the sales tax. The resulting revenue allowed the city to pay off the last of its bond debt in 2008. “I loved my days as mayor because we actually solved problems,” said Eltife, who left that office after reaching his term limit. "Solving problems" is something Eltife talks about often, along with the value of "political courage." In his mind, the latter is in short supply at the Capitol but critical to achieving the former. He ticked off issues that loomed large in the state Capitol a decade ago — school finance, transportation, water — and noted that all remained major challenges with high price tags in this session. Eltife’s colleagues in the Legislature cite his independent streak as one of his defining attributes as a senator. “If you know Senator Eltife, you don’t turn to Senator Eltife [and say], ‘Don’t do this or please do this,’” Lt. Gov. David Dewhurst said during a recent public discussion with business leaders. “Kevin is a dear friend, and he does a great job in the Senate." Eltife was born and raised in Tyler but traces his heritage to Lebanon, where both sets of grandparents immigrated from. His father died before he was 2. While Eltife was growing up, his family relied on government benefits. He now owns and runs Eltife Properties, a commercial real estate firm. In 1991, a frustrating experience applying to the city of Tyler for a sidewalk variance motivated him to run for City Council. After three terms as mayor, Eltife ran for a Senate seat left open by Bill Ratliff, who became lieutenant governor. Ratliff encouraged Eltife to run. Eltife said he had tried to bring the same focus on reducing debt that he had as mayor to the Legislature. Over the years, he has regularly rallied against efforts to pay for government services on credit. In 2007, he was one of a handful of senators to vote against a $3 billion bond measure to finance cancer research in the state. Now, as the agency created to allocate that money is mired in controversy, Eltife has filed a measure to block sale of the remaining bonds. Eltife has repeatedly proposed raising the sales tax. In 2007, his bill to raise the sales tax and lower local property taxes passed the Senate. Last week, Eltife filed legislation that would ask voters to approve temporarily increasing the state sales tax rate by half a percentage point to pay off the Texas Department of Transportation’s debt, which stands at $13 billion. “We pay the debt off like 15 years earlier. We save $6 billion in taxes,” Eltife said. That measure has divided some conservative activists. Michael Quinn Sullivan, the president of Empower Texans, a conservative group active in state politics, suggested on Twitter that Eltife must not expect to run for re-election as a Republican. “Fortunately, not everyone shares Eltife’s big-tax vision for a less prosperous Texas,” Sullivan wrote in a recent post on his group’s Web site. Sullivan did not respond to requests to comment for this article. JoAnn Fleming, chairwoman of the advisory committee to the Legislature’s Tea Party Caucus, said she could support Eltife’s proposal. Although she did not enjoy raising taxes, Fleming said she could back Eltife’s plan if it were part of a package that reformed the way the state financed road construction. At a rally on transportation financing on the Capitol steps this week, Fleming — who has known Eltife for 20 years — singled him out for praise. While it may take multiple legislative sessions, Eltife said he was intent on achieving at the state level what he had in Tyler: instituting a plan to reduce public debt. “Elected officials of the last 10 years have put this state into debt that will take 30 more years to pay off, and that’s just wrong,” Eltife said. “We don’t want to raise taxes just to raise taxes, but at some point we’ve got to fix these problems."